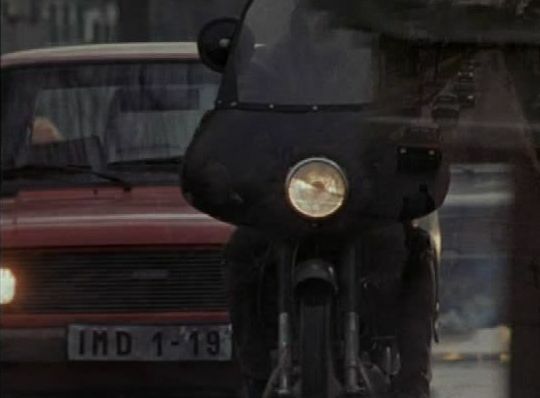 IMCDb.org: 1983 Zastava 101 in "The Assignment, 1997"
That's an East German number plate (probably a replica). Ixx = East Berlin. PS One of earlier Western-Europe Importers of Zastava 101 was the French Firm Chardonnet(Lancia-Autobianchi Importer already)that put on sale the car in France as Zastava 128(was shown at 1972 Paris M.S.,just the next year when the car was launched in Yugoslavia,1971),while the following 3-door version--known as Zastava 101 Mediteran at home--was called strangely Zastava 128 Coupè for French market;other earlier export names:Zastava 1100 in Belgium(was of that type the first I've seen"live"on the road in 1977),Zastava 101 ZLM(3-door,1.3)in England(imported by Zastava Cars(GB)Ltd.),Fiat 1100 Z(Imported by Deutsche-Fiat of Heilbronn,former Neckar-Fiat)in West-Germany('cause in GDR was Zastava 101);for some African markets(among which Egypt,where was built in 128 1st series body 4-doors version as El-Nasr=eagle--Nasr 128,later in 1988 switched at 128 CL 3rd series body,with dies bought by Zastava,but--that build the same as Zastava 128 Skala--not by Fiat and 1.3 engine,renamed El-Nasr 128 GLS)was also available later(around end of Eighties)with "tropicalized engine trim" that would features centrifugal-type air filter,among other modifications for be protect at hot climates in these tropical Countries. Never heard of Zastava 128 coupé for French market. Chardonnet started importing the 5 door an 5 door only Zastava 101 in France in 1973. This car was called "Zastava 1100 super". Chardonnet has already some problem with Fiat because of the Polski-Fiat and Fiat was not always happy by this army "communist Fiat" coming at discounted price...At that time, the confusion was strong, even Chardonnet played with that. On every advert was a big logo "Olio Fiat"! If I remember right Zastava 1100 was sold as a "Fiat 128 Z" in Finland by Autonovo and later by a different importer as a "Zastava 1100". It was a lot cheaper than Fiat 128 and offered a hatch but still it didn't sell well. Maybe 2000-3000 cars were sold and in year 2000 about 90 of these cars were still registered. Now it's below 30 cars. I know only one Zastava 1100 in my city. About Seat 600 and 850; these were never officially imported, I remember that a very little number of Seat 850 sedans were imported (less than five cars). bref wrote Never heard of Zastava 128 coupé for French market. Chardonnet started importing the 5 door an 5 door only Zastava 101 in France in 1973. This car was called "Zastava 1100 super". Chardonnet has already some problem with Fiat because of the Polski-Fiat and Fiat was not always happy by this army "communist Fiat" coming at discounted price...At that time, the confusion was strong, even Chardonnet played with that. On every advert was a big logo "Olio Fiat"! PS For the blog written by bref:will be correct to say into Zastava story that one of early Fiat cars made by Zastava in 1954 was the Z 1400 BJ,based on 1954 Fiat 1400A,CKD built,together with Zastava AR 51,Yugoslav version of 1951 Fiat Campagnola offroad,conceived for their Army,which 1901cc.engine--a grew-up-displacement of 1395 cc.fitted on 1400 BJ--was shared together at small Zastava Z 615 truck,clone of 1951 Fiat 615);Zastava Z 1300 comes some years later,1961.